Ann Bartholomew, left, and Martin Buser, four-time winner of the Iditarod. 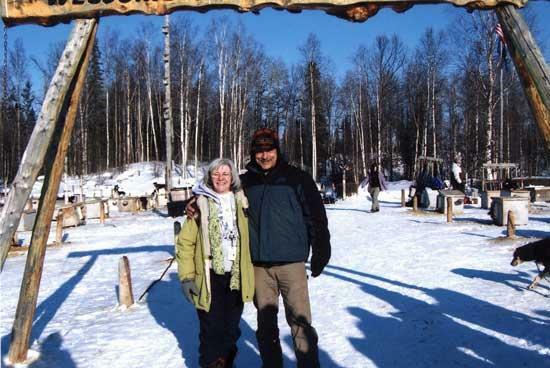 Ann Bartholomew, sixth grade teacher at Short Mountain School, recently traveled to Anchorage, Alaska, for the Iditarod Conference for Teachers. Bartholomew has used the Iditarod Dogsled Race as part of her mathematics and language curriculum for several years. This year Bartholomew was invited to be a presenter at the conference to share some of her lessons with other teachers from across the United States. The Iditarod Dogsled is called the “Last Great Race on Earth.” It covers about 1100 miles from Anchorage to Nome, Alaska. The terrain and temperatures are extreme, and the athletes are the dogs. The race lends itself to an interesting unit of study, especially in math. Participants in the Winter Conference visited the kennel of Martin Buser, four-time winner of the Iditarod. They visited Iditarod headquarters during the vet check and were able to meet several mushers as they checked in their dogs. Part of the group attended a reception hosted by John Baker, who became the winner of this year’s race. Speakers ranged from the head Iditarod veterinarian to one of the first women to run the Iditarod to a teacher in one of the village schools. The Winter Conference for Teachers is sponsored by Exxon Mobile. Exxon Mobile is a big supporter of education involving the Iditarod, especially in the areas of mathematics and science. Bartholomew’s presentation focused on some of the math activities she uses in her classroom. She shared three lessons her sixth graders did. One of the lessons involved finding dimensions of a rectangle if you only know the area, and the teachers were soon on the floor working out the size of snowshoes. Another activity was about the caloric intake of sled dogs. The average dog uses 10,000 calories a day when running. The Short Mountain sixth graders had done Internet searches to find the calories in a serving of several common food items and had then calculated how many servings it would take to total 10,000 calories. This led to interesting discoveries about some of the foods we commonly eat. During the Idtarod, the SMS sixth graders solve daily word problems connected to the Iditarod, track high and low temperatures at the checkpoints, and follow their mushers using the school computer lab.